ಜೂನ್ 2014 ರಲ್ಲಿ, ವಿಶ್ವಸಂಸ್ಥೆಯ ಶೈಕ್ಷಣಿಕ, ವೈಜ್ಞಾನಿಕ ಮತ್ತು ಸಾಂಸ್ಕೃತಿಕ ಆಯೋಗವು ರೇಷ್ಮೆ ಮಾರ್ಗದ ಚಾಂಗಾನ್-ಟಿಯಾನ್ಸಾನ್ ಕಾರಿಡಾರ್ ಅನ್ನು ವಿಶ್ವ ಪರಂಪರೆಯ ತಾಣವೆ೦ದು ಘೋಷಿಸಿತು. ↑ Miho Museum News (Shiga, Japan) Volume 23 (March 2009). "Eurasian winds toward Silla". ↑ Gan, Fuxi (2009). 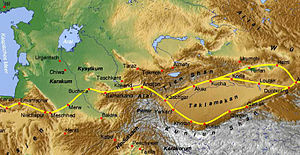 "The silk road and ancient Chinese glass". Shanghai Institute of Optics and Fine Mechanics, Chinese Academy of Sciences (Ancient Glass Research along the Silk Road, World Scientific ed.). p. 41. ISBN 9812833560. ↑ "Republic of Korea | Silk Road". en.unesco.org (in ಇಂಗ್ಲಿಷ್). Retrieved 2017-02-23. ↑ Jerry Bentley, Old World Encounters: Cross-Cultural Contacts and Exchanges in Pre-Modern Times (New York: Oxford University Press, 1993), 32. ↑ Jerry Bentley, Old World Encounters: Cross-Cultural Contacts and Exchanges in Pre-Modern Times (New York: Oxford University Press, 1993), 33. ↑ Compare: Hansen, Valerie (2012-10-11). 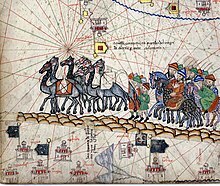 The Silk Road. OUP US. p. 218. ISBN 9780195159318. Retrieved 2016-07-22. Jewish merchants have left only a few traces on the Silk Road. ಈ ಪುಟವನ್ನು ೯ ಜನವರಿ ೨೦೧೮, ೧೦:೨೭ ರಂದು ಕೊನೆಯಾಗಿ ಸಂಪಾದಿಸಲಾಯಿತು.